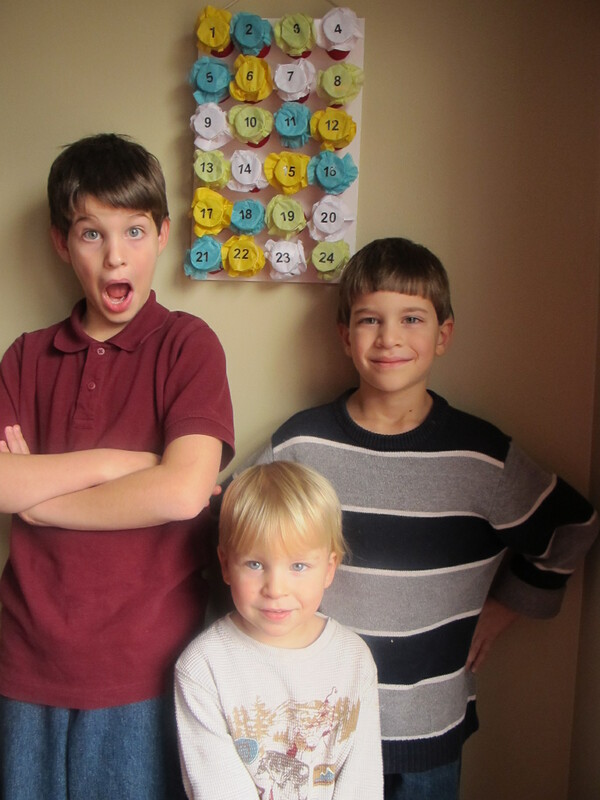 The directions to this Advent calendar were featured in the November 2013 issue of Family Fun magazine. 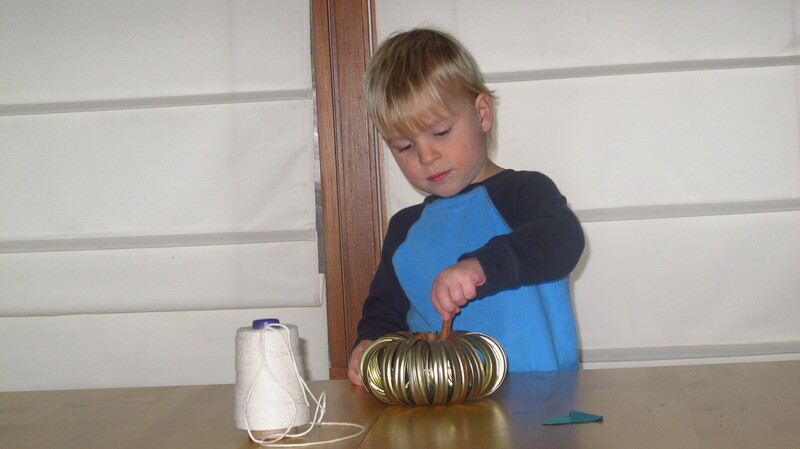 It can be made in about an hour, uses recycled toilet paper rolls and is lots of fun for the kids. I like that I can control what goes in the pockets. I put trinkets & Legos, gum, candy, money, or slips of paper with a fun activity we are going to do on that day such as “Visit Santa” or “Bake Cookies”. 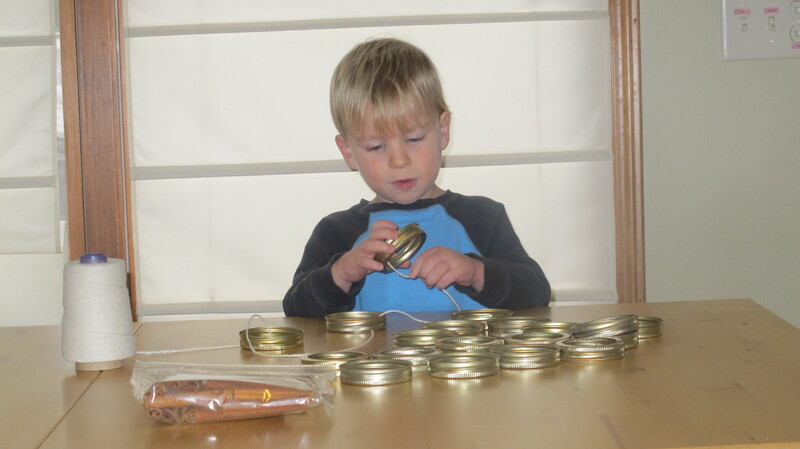 My youngest “popping” his hole. 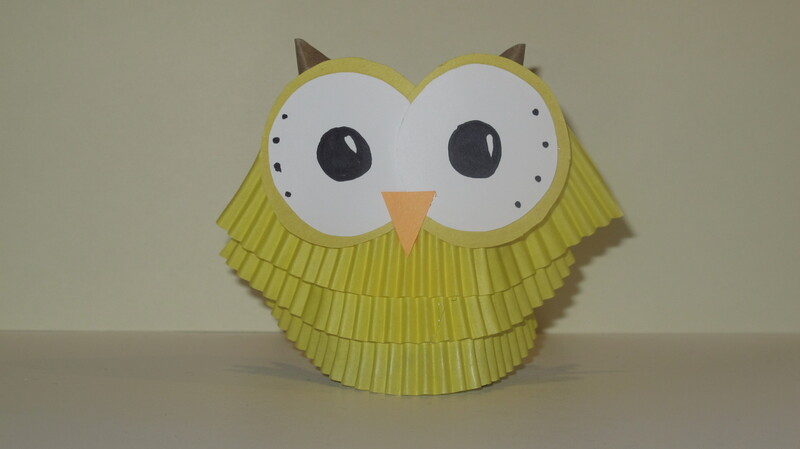 To make this you will need: 1 (16×10-inch) piece of foam board, 12 toilet paper rolls, scissors, paint, paint brush, hole punch, string or ribbon, Tacky glue, tissue paper, 24 small rubber bands, a template for a 3½ inch circle, 24 items to put in the tubes, and number stickers. 2. 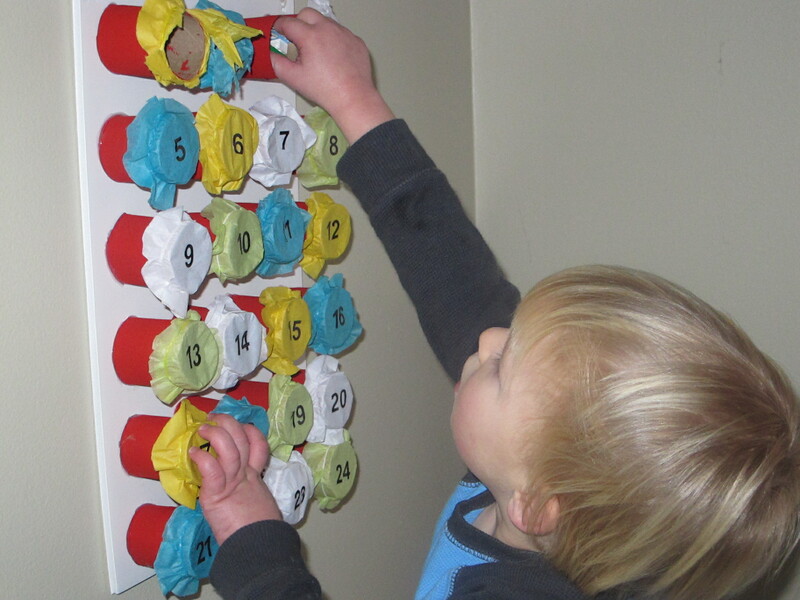 Punch two holes in the short side of the foam board and attach a string or ribbon for hanging. 3. After the paint has dried lay out the tubes on the foam board. 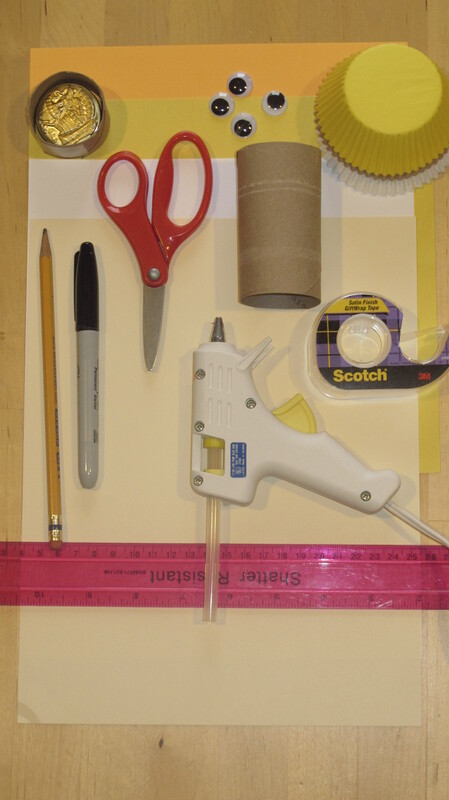 Pour some Tacky glue on a paper plate and dip the bottom of each tube in the glue, then place it on the foam board. Let dry. 4. 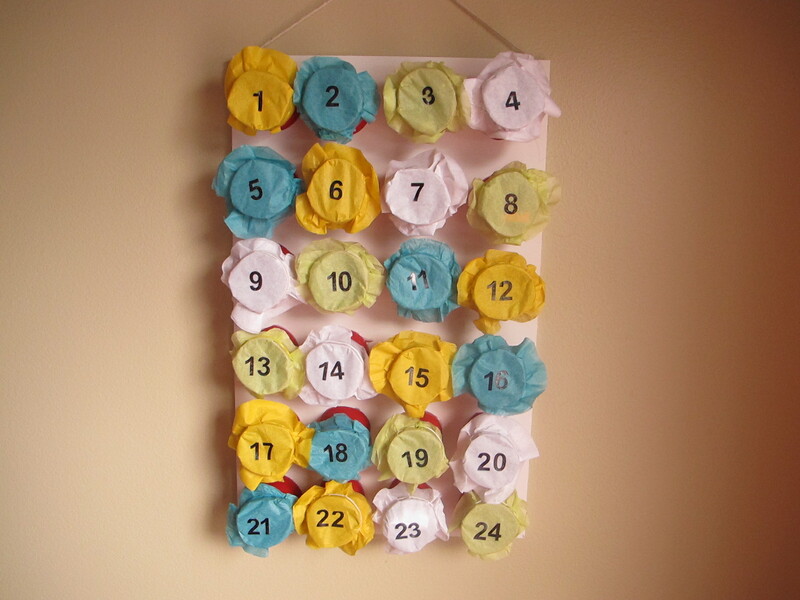 Using the 3½ inch circle template cut the 48 tissue paper circles. You should be able to cut at least 6 at a time. 5. 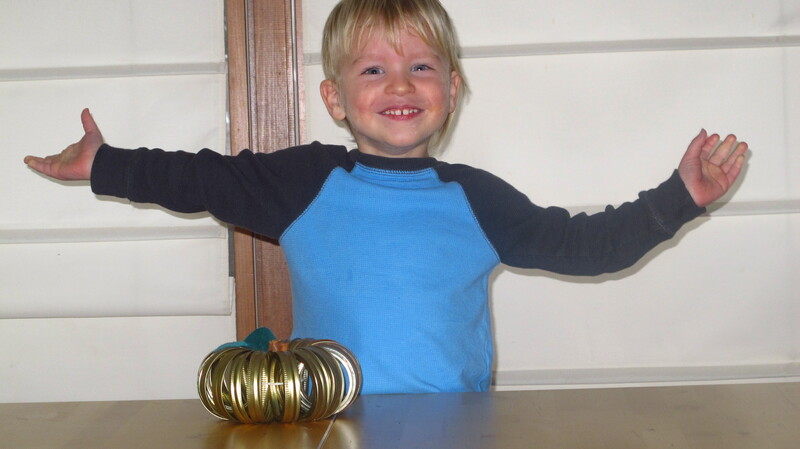 When the paint is dry on the tubes fill each one with the trinkets. 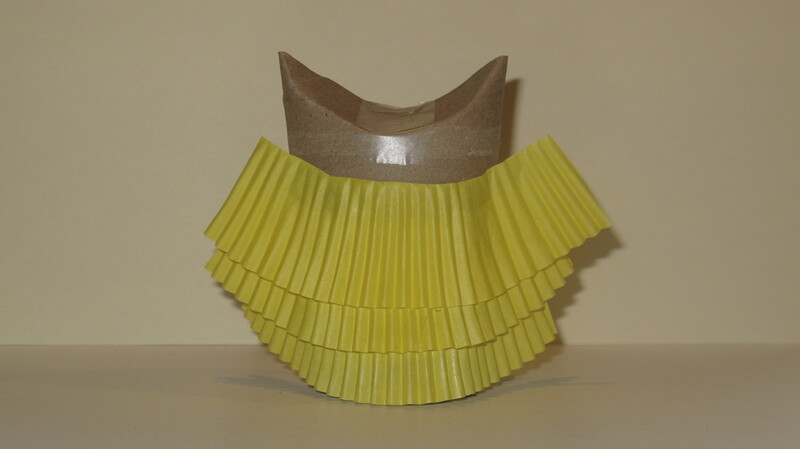 Place 2 tissue paper circles over the top of each roll and secure with a rubber band. Put the number stickers on the tissue. How cute it this little guy? 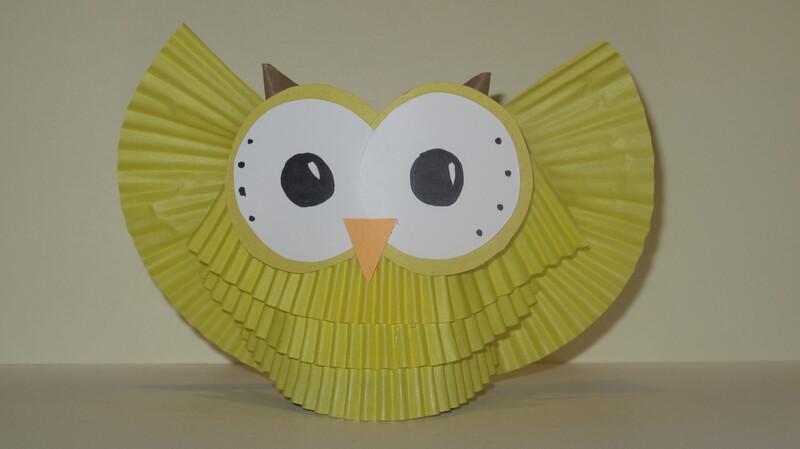 To make you need: White, Orange & Yellow card stock, 4 cupcake liners, toilet paper tube, scissors, tape, ruler, glue gun, black marker or wiggle eyes, pencil, large coin. Cut 1 inch off the bottom of a toilet paper tube (save the ring). 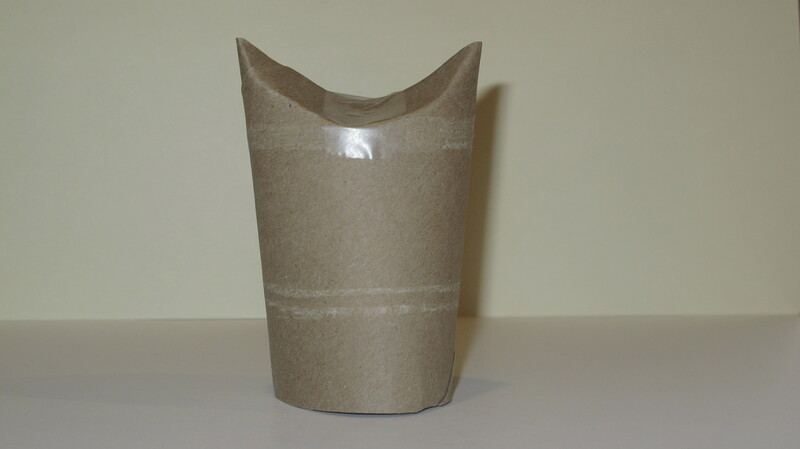 Fold in the top off the tube and tape it. 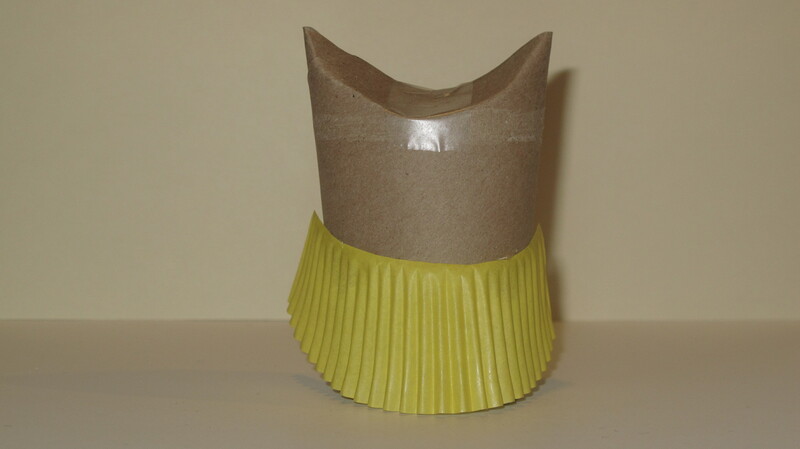 Cut the bottom ring off of a cupcake liner, cut it in half and glue it to the bottom of the roll. Add 2 more liner halves. 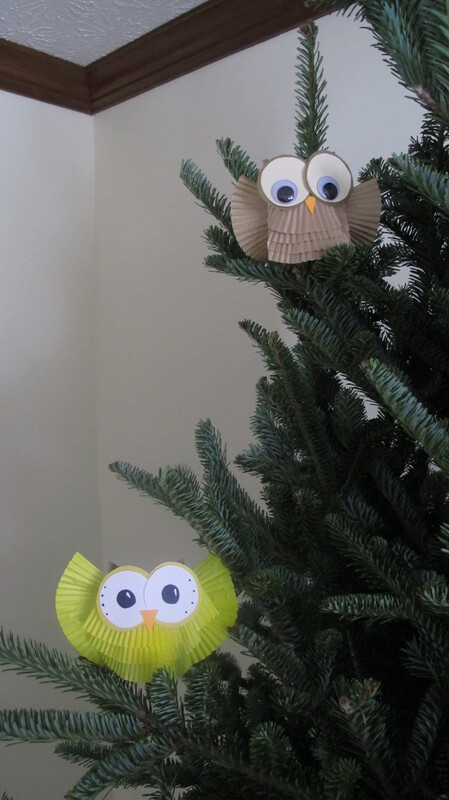 Using the ring that was cut off the tube as a template cut out eyes from the cardstock. Using a slightly smaller object such as a large coin; cut circles for the whites of the eyes and draw the eyes and dots. 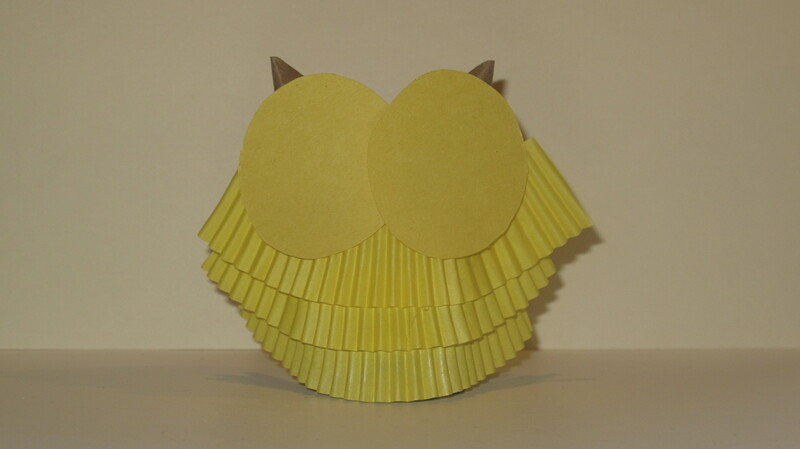 Cut a triangular piece from orange cardstock for the beak. 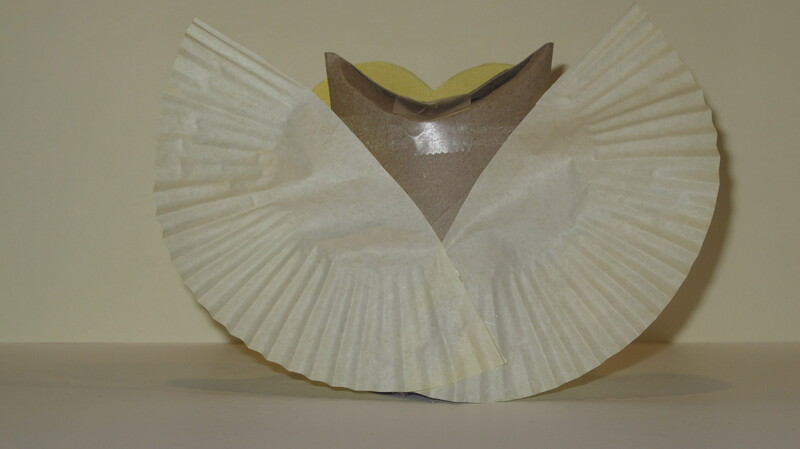 For the wings cut a cupcake liner in half and flatten them. Glue to the back. 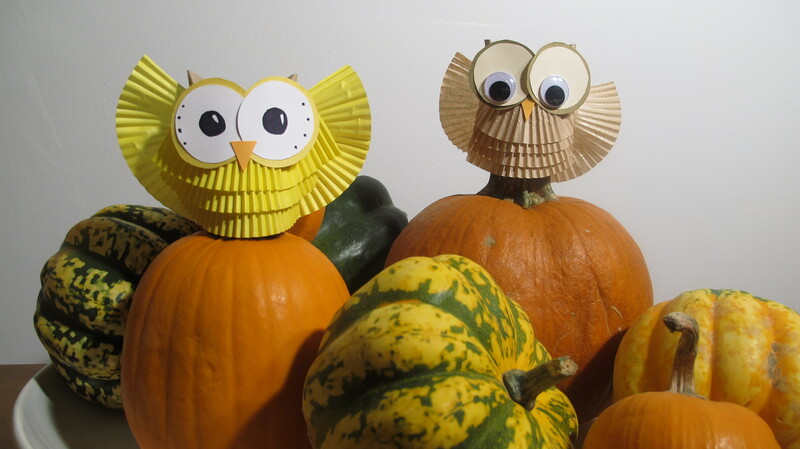 or your pumpkins in the fall. Originally published in Family Fun Magazine. Be sure to check out my Shopping List PDF. I organize my list on a chart by recipe. Why? Well, sometimes I decide that I don’t want to make a recipe or I can’t find a main ingredient and by listing them by the recipe I avoid buying items that I don’t need. The list is also to my blog reader’s advantage because if you don’t like some of recipes I use you can plug in your own in recipe in that spot. Our meal planning starts on Tuesdays because store sales here run Wed. through Tues. The ads for the next week come out on Mondays. So I plan on Mondays, and shop on Tuesdays. By waiting until the end of the sale I can see what is on sale the following week so I don’t over pay on things I am buying today. Also, I find that stores have generally restocked sale items that often get picked over at the start of a sale. Thursday: Roasted Pork Tenderloin with Slaw. Check out the slaw recipes I have 3 different types using celery, celery root (celeriac) or cabbage. Friday: Go out to eat! Saturday: Butternut Squash Risotto from the December 2013 issue of Family Circle. Have it with a spinach salad. Just make sure to save a cup of spinach for the stuffed squash on Monday. 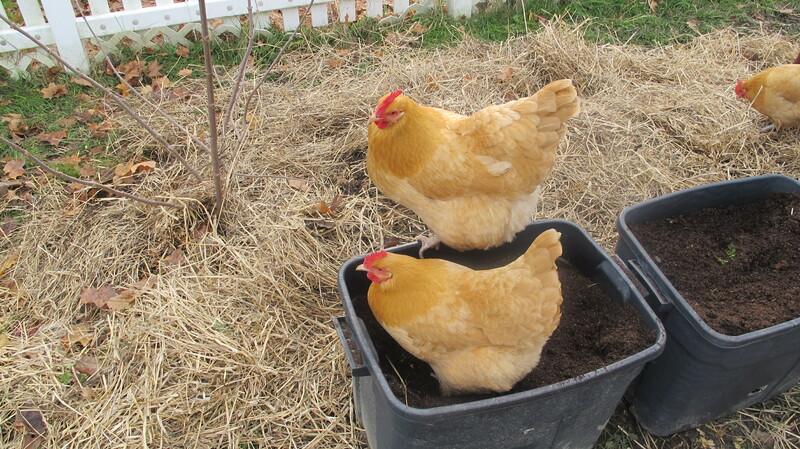 With winter upon us the ground is frozen and our chickens are suffering with dust bath withdrawal. The poor things are rolling around in the pine shaving litter in the coop and it just isn’t the same (or as healthy) as a good roll in the dust of a shady garden patch. To help them with their bathing I put together dust boxes for them and I put one in the coop so on cold days they can bath until their hearts are content. By being in the coop the bath also stays dry and doesn’t freeze hard like the garden dirt. The bins that I am using are actually my self watering bins, I don’t need them in the winter, the chickens can borrow them. This is what is in them: 1 part peat moss, 1 part compost, and 1-2 cups of food grade diatomaceous earth. This week’s menu utilizes the last of the turkey from Thanksgiving (the soup brings out the best of all those little stubby pieces that no one wants to put on their sandwich). The feature meal is latkes for Hanukkah, even though our family is Christian we like latkes too. Also, 3 of the 6 recipes are made in the slow cooker to decrease with the stress of Christmas shopping and concerts, at least dinner will be made in the morning. Sunday: Fettuccine with Spicy Sausage and Cabbage Ribbons from April 2013 issue of Food and Wine. I use this Italian Sauce in place of the tomato sauce in the recipe. I am not a crafty person. I wish I was and I attempt often and I fail often. However, this year I wanted a centerpiece for my Thanksgiving table. Nothing fancy, just something besides a salt and pepper shaker. So I headed to Pinterest and I found the PERFECT craft/centerpiece so simple, reusable, and I didn’t even have to go to the store. The genius behind it is Kristin at Yellow Bliss Road. So my 3 year old and I made it today. 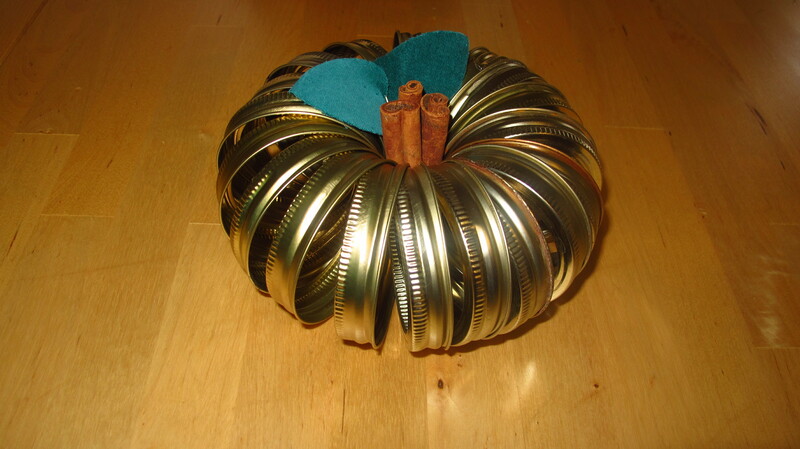 Supplies: 20 canning rings, string, 3 cinnamon sticks, fabric leaves, and a hot glue gun. 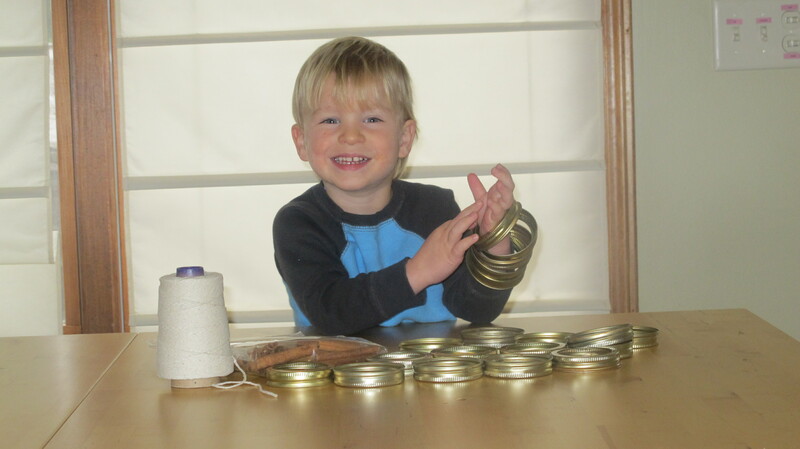 String canning rings on string. Tie string and insert cinnamon sticks in the center. Glue on leaves. Ta Da! Don’t you love the peanut butter on his face! My husband is taking the boys camping this weekend so I will be taking the opportunity to make some sauce. 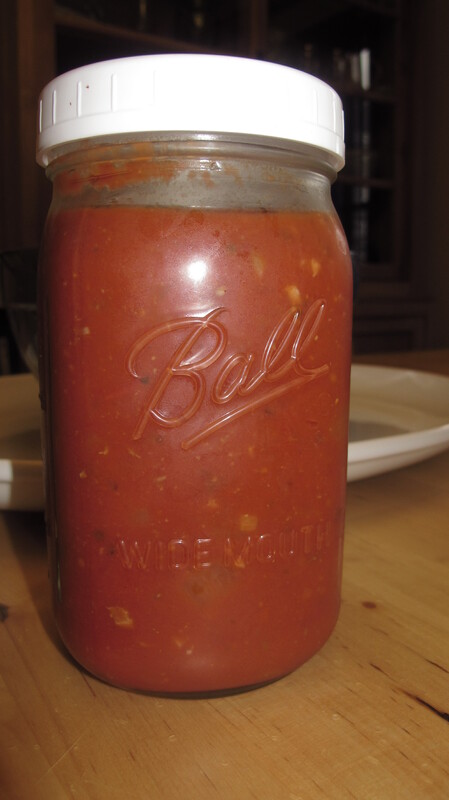 I like to make a big batch of it and freeze it in quart (freezer safe) canning jars. It will keep in the refrigerator for 4 days. The meatballs freeze beautifully as well. After baking move them to a clean baking sheet and place in the freezer. Once frozen place them in freezer bags or another freezer safe container, keep up to 6 months in a deep freezer. 1. Place a mesh sieve over a bowl. Add the tomatoes; force through to remove the seeds. 2. In a large pot, heat olive oil over medium. Add the pork ribs/necks; cook until browned, turning as needed about every 4 minutes. Transfer to a plate. 3. Add the onion, shallots, celery, and bell pepper; cook over medium, 5 minutes. Add garlic; stir 30 seconds. 4. Add the tomatoes, carrot, thyme, oregano, black pepper, bay leaves, sugar and salt to taste; return the ribs to the pot. Bring to a boil, then lower heat and simmer until meat is tender, 2-3 hours; remove bones and carrot. 6. Serve over choice of pasta with meatballs and grated cheese. 2. Form mixture into approx. 40 (2-inch) balls. 3. Place balls on lined baking pan and bake at 400° for 20 min. turning over halfway through.